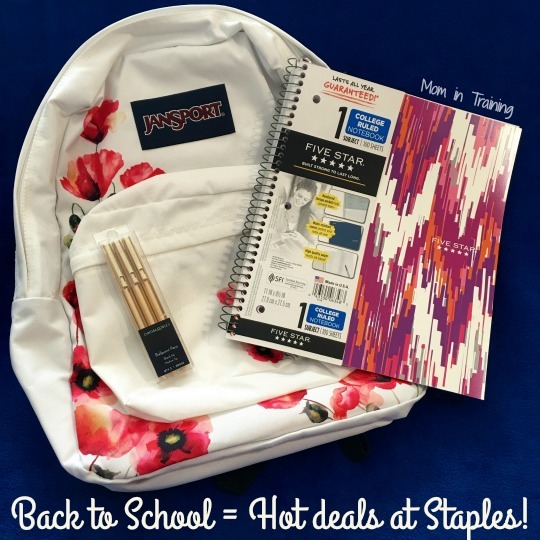 Stacy Tilton Reviews: Back to School = Hot deals at Staples! Back to School = Hot deals at Staples! Probably one of the most exciting times in my house in August is back to school shopping - at least that's what my daughter will tell you. She absolutely loves shopping for everything back to school related, not just clothes but school supplies too. She actually has had many things picked out for back to school sitting in a pile in her room for a few weeks now. And as soon as the stores starting featuring their "Back to School" specials in their ads she just had to check them all out. One of her favorite ads is Staples because she knows they carry so many different supplies and even carry special ones just for back to school. I will even admit that we've been there pretty much every week since the ads started coming out just to at least "check out" what they have. It's really quite entertaining to me to see her run to the school supplies section when we enter the front doors. But hey, I'm glad she's so excited about going back to school. And I'm glad she knows to check out what's on sale every week at Staples to slowly gather her supplies. This back-to-school season at Staples, the runway meets the hallway as traditional school tools are transformed into fashion-forward supplies that combine bold innovation and style to match students’ needs and wants from the classroom to the college dorm room. You can find the highlighted supplies and so many more in store and online at Staples.com. Disclosure: I received the products featured in this post for free in exchange for my honest and unbiased thoughts. All thoughts and opinions state are my own and are in no way influenced by my partnership with mentioned brands. I found some great deals at Staples this year when I was back to school shopping for my grandsons. I love their easy rebates, too!